thank you for visiting abc party rentals! 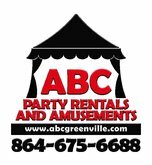 ​ABC Party Rentals and Amusements has been in the Greenville rental industry for 15 years. Our goal is to help make your event unforgettable! Please look through our website to view our inventory for wedding, party, and mechanical rentals. We would love to be able to work with you to make your event a perfect one! OPEN MONDAY-FRIDAY 8AM - 5PM & SATURDAYS FROM 8AM - 11AM. CLOSED ON SUNDAYS.